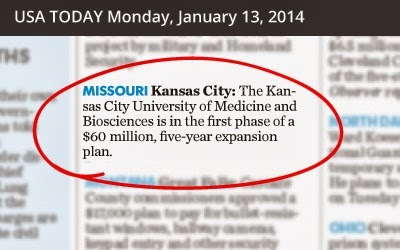 KCUMB garnered significant media attention recently regarding our plans for the future. The Kansas City Star published an original piece on Jan. 8, sharing with its readers the good news about our Campus Master Plan, our new clinical partnerships and preparations for the upcoming centennial celebration. The article was subsequently picked up by the Associated Press wire service, resulting in publication in more than a dozen newspapers throughout the U.S., as well as being highlighted in USA Today and regional broadcast media outlets. The Tribune/San Luis Obispo, Calif. Check back to our KCUMB in the News section of our website to read how KCUMB, our faculty and alumni are being recognized by local and national media.